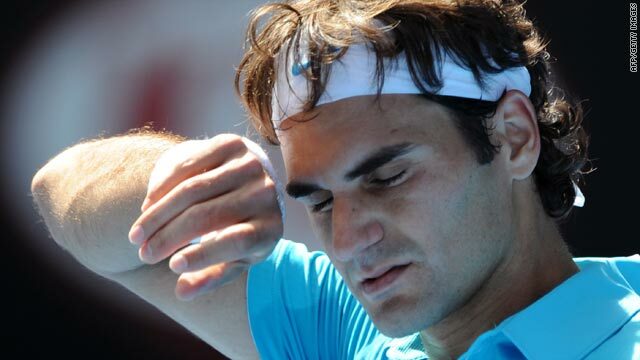 Top seed Roger Federer was relieved after coming from behind to beat Igor Andreev in his opening match. (CNN) -- World No. 1 Roger Federer battled back from losing his first set of the decade's opening Grand Slam tennis tournament on Tuesday to book a place in the second round of the Australian Open. Third seed Novak Djokovic also progressed but Robin Soderling, who lost to Federer in last year's French Open final, became the first high-profile men's casualty this week. Top seed Federer, beaten in last year's final in Melbourne by Rafael Nadal, came from behind to beat Igor Andreev 4-6 6-2 7-6 (7-2) 6-0. The Swiss dropped a set in the first round of a Grand Slam event for the first time since 2003, and faced three set-points with the unseeded Russian serving at 6-5 in the third before forcing a tie-break. "He's got incredible acceleration on his shots, obviously, especially his forehand," Federer, who next plays Romania's Victor Hanescu, told the ATP Tour Web site. "A few hiccups, but I think those are more due to his good play. So it was a good first round for me, anyway." Eighth seed Soderling blew a two-set lead as he crashed out, losing 5-7 2-6 6-4 6-4 6-2 to young Spaniard Marcel Granollers. The 23-year-old doubles specialist, ranked 113th in singles, will next play Colombia's Alejandro Falla. Djokovic, the 2008 champion, defeated world No. 74 Daniel Gimeno-Traver of Spain 7-5 6-3 6-2 to set up a clash with Marco Chiudinelli of Switzerland. Sixth seed Nikolay Davydenko, who has beaten Federer in their past two meetings, kept alive the possibility of another encounter in the quarterfinals by beating German qualifier Dieter Kindlmann 6-1 6-0 6-3. The Russian will next face unseeded Illya Marchenko of the Ukraine, who upset Spain's former world No. 1 Carlos Moya 7-6 (7-2) 7-5 6-3. Other seeds such as Tommy Haas, Fernando Verdasco, David Ferrer, Lleyton Hewitt, Gael Monfils and Marin Cilic also progressed along with former tournament runners-up Jo-Wilfried Tsonga, Marcos Baghdatis and Rainer Schuettler, but former world No. 7 Richard Gasquet was eliminated. The Frenchman, now ranked 57th after last year serving a ban for testing positive for cocaine which was reduced on appeal due to mitigating circumstances, was defeated in a five-set epic by Russian 20th seed Mikhail Youzhny. Gasquet won the first two sets but Youzhny finally won 6-7 (9-11) 4-6 7-6 (7-2) 7-6 (7-4) 6-4 in four hours and 52 minutes to earn a second-round clash with unseeded Czech Jan Hazek, who beat American Robby Ginepri in straight sets.